Josh Bixler, Flite Test president, addresses everyone at the pilots’ meeting. Do you remember seeing Flite Test YouTube videos where the originators designed, tested, and sometimes crashed aircraft? Flite Test has grown and expanded its reach, while continually trying to make a newcomer’s entry into flying model aircraft easier, inexpensive, and less traumatic if there is a crash. It was great to see Flite Test in Lake Wales, Florida, for Flite Fest South on November 3-5, 2017. This festival of flight was well attended. 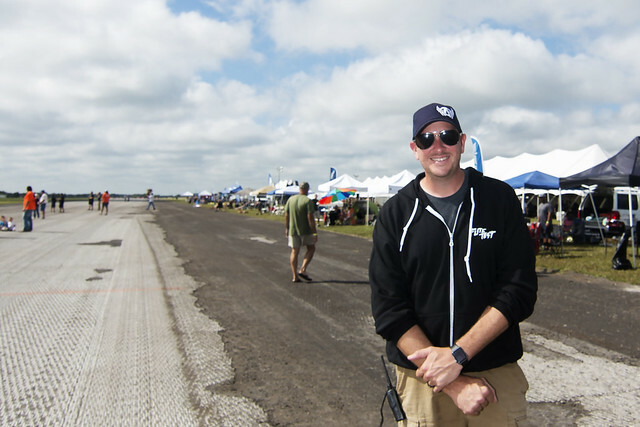 Flite Test President Josh Bixler envisions making it easier for people to build and fly RC airplanes and create great memories at the same time. Attendees shared ideas and helped each other build airplanes, FPV quadcopters, and flying wings. From beginners to seasoned pilots, everything moved along while people were building and flying anything and everything they could imagine. According to its website, “entertain, educate, and elevate” the world of flight is what Flite Fest is all about. The Flite Test team is active within its community, and hopes to encourage participants to use their hobbies to inspire people in a positive way. Horizon Hobby team manager, Craig Greening, with his Junkers Ju 88. The 20-pound aircraft has a 12-foot wingspan and is flown on two E-flite Power 60 motors. Chanda Rainier (L) and her son, Skylar Rainier, enjoying Flite Fest South. Combat had many participants and plenty of midair collisions. This full-scale U.S. Coast Guard Dolphin turbo jet helicopter provided a nice photo pass at the event. Jorge Giroud and his 4-year-old grandson, Lucas, built and flew an airplane as part of the event. At Flite Fest, you could even attend a chapel service where all were welcome to sing songs and celebrate life with overflowing camaraderie all around them. Several volunteers helped at the event and many of the staff’s spouses also joined in the festivities. Flite Fest encourages people to be one huge family. More than 550 pilots flew a wide selection of electric-powered aircraft and crazy do-it-yourself projects. There was continuous full-scale and model aircraft activity throughout the venue. It is always promising to see full-scale airports working together with AMA modelers, where many types of flight activities occur at the same time. Beyond model aircraft, full-scale helicopter, airplane, and paramotor rides were available, along with half-price skydiving lessons from Aviator PPG. The Flite Fest innovation theme was so strong that when Gavin Klein arrived from Miami without any airplanes to fly, he purchased an electric-powered mini tricycle at Goodwill and added radio control overnight. George Giroud brought his 4-year-old grandson, Lucas, to the STEM tent where the pair built an airplane, walked outside, and flew it within minutes. Needless to say, Lucas had a wonderful experience with his grandfather that will hopefully expand his interest in model airplanes. One of the coolest new innovations by Michael Maymi of Aimdroix Company was an XRay Tilt-Rotor quadcopter. The frame of the aircraft remains level with the ground while the rotors tilt. It was great to see the 12-foot wingspan Junkers Ju 88 and monster 18-foot wingspan Ju 188, built in the spirit of Flite Fest by Horizon Hobby’s team manager, Craig Greening, and pilot, Gavin Trussell. Both aircraft were built within 30 days and for less than $100. Kyle Edwards and his team built one of the largest airplanes at the event. It was mainly constructed in the build tent. They worked hard, and on Flite Fest’s final day, they were finally able to launch the 10-foot wingspan Spruce Goose, which was powered by eight Emax 2822 motors. Many on-site vendors stayed busy, making various specialty items available to attendees. The Paradigm Aerobat Team performed with its powered paramotor gliders, shooting out smoke trails as they flew above the runway. Thanks to the U.S. Coast Guard for making some great photo passes in a MH-65 Dolphin turbo jet helicopter. Horizon Hobby pilot Gavin Trussell displays his all-foam Ju 188. It has an 18-foot wingspan, weighs 30 pounds, and is powered by two E-flite Power 60 brushless motors and two Castle Creations 125-amp ESCs. Abel Almaguer prepares to fly his FPV wing. FPV flying was popular at Flite Fest South. Young people are the future of our sport and Flite Fest is a wonderful way to attract youth to flying. Flite Test is continually improving its products and will soon be introducing balsa kits. Flite Fest events have taken place in Vallejo, California; Malvern, Ohio; as well as this one in Florida. Flite Test is considering adding another location in Texas. Thank you to everyone at Flite Fest for the wonderful hospitality, and best wishes for a promising future.